Uttern take their inspiration from those who really know – Uttern owners themselves. That’s why our priorities are your priorities. Safety above all. Followed by style, comfort, versatility and storage. Then, we place that intelligence right at the heart of our design. We believe there is no other way to achieve a boat that truly answers your needs. al fresco diner. Freedom is more than space – it is a state of mind. 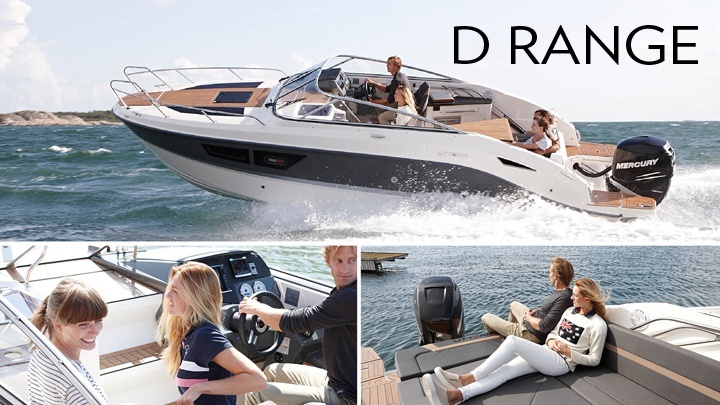 Uttern design boats for active boaters. That is why we design without compromise. High freeboards and easy access to land and water bring real peace of mind – especially if children are on board. A generous sociable cockpit will help you feel at home no matter where you are. And an easily deployable canopy leaves you free to enjoy more time on the water. Sometimes different really does make a difference. If you are looking for a boat that offers everything you need right from the start – then you are looking for an Uttern. Our boats come with the kind of features that can be optional extras on others – like a chart plotter and depth sounder, laminated teak and canvas. There is even a full complement of mooring equipment. Freedom – right from the start. Things change. Lives change. That’s why when we introduce a new boat, we ask Uttern owners again for their opinions. On everything from safety to finish to storage. It’s this constant commitment to what our owners want that makes an Uttern the considered choice. The more you leave the world behind, the more it can touch you.